Get ready for the ultimate Silly Bandz experience with Silly Bandz, the Silly Bandz-based videogame coming soon to the Nintendo DS! When the press release about the new Silly Bandz videogame turned up in my inbox, my first reaction was that if this really is "the year's biggest pop culture phenomena," why do I have to Google it? My second reaction, following said Googling, was, "What did I do to deserve this?" Seriously, did I run over somebody's dog or something? Yeesh. Silly Bandz, for those still blissfully not in the know, are little silicone wrist bands that come in a variety of shapes, like animals and other random objects, that kids collect, trade, wear and somehow, I guess, play with. They debuted in November 2008 and are currently sold in 8000 stores across the U.S., which apparently makes them an ideal fit for videogames. 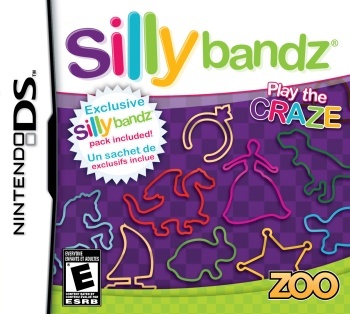 So it is that Zoo Games Inc., the purveyor of fine digital entertainment like Shawn Johnson Gymnastics and Minute to Win It, is bringing us Silly Bandz, a new game for the Nintendo DS in which players must use their arsenal of Silly Bandz to rescue other Silly Bandz by "taking aim at the cages in each level," which, one must assume, contain the captive Bandz. The newly freed Bandz will become part of the player's collection and join in the quest to cast aside the bondz of Bandz everywhere, but with 200 Silly Bandz, 40 levels, four unique environments and even support for multiplayer battles, it won't be an easy task! But wait! There's more! Silly Bandz for the DS will include an exclusive 12-pack of videogame-themed Silly Bandz, shaped like a game controller, joystick, arcade machine and more. Wow! And how much would you pay for all that excitement? It doesn't matter - if you have a child with a DS and a few Silly Bandz on her arm, you will pay $29.99 plus shipping, handling and applicable taxes, or you'll hear about until the day pogs become cool again. And now it's time for an informal Escapist poll! Which is worse: Letting kids play some Assassin's Creed now and then or teaching them that it's okay to drop 30 bucks on a videogame about weirdly shaped rubber bands? I'm pretty sure there's a valuable lesson to be learned in there somewhere but for the life of me, I can't figure out what it is.